High-quality, clean, 100% cellulose fiber (paper) mixes in water at an accelerated rate. Dyed a dark green colour for easy metering. Provides erosion control superior to straw for nearly the same cost. Ideal for general seeding. Loose dense packaging allows material to load / mix faster and easier. Provides ideal performance for both jet-agitated and mechanically-agitated hydro seeding machines. Produced from high quality recycled newsprint and other organic materials. Ideal for repairing and establishing vegetation on smaller areas. Technology of Thermo-mechanically processed virgin wood fibers and blend of cross-linked bonding agents. Forms a strong, durable bond with the soil surface, providing excellent erosion control performance on the most critical slopes (up to 1:1) for up to 12 Months. Technology of Thermo-mechanically processed virgin wood fibers, blend of cross-linked bonding agents, and engineered reinforcing fibers. Immediately (requires no cure time) forms an intimate bond with the soil surface, providing optimal erosion control performance on the most critical slopes (up to 1:1) for up to 18 months. *Blankets and Tackifiers available upon request. 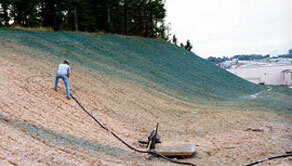 *For other Hydroseeding products, please call our office and speak to one of our turf professionals.